Some ovarian cysts are harmless while others have an imminent threat to a woman’s health. 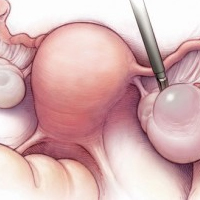 There are various ovarian cyst’s treatment depending on individual circumstances. In most cases different types of cysts are functional and developing at the end of a woman’s menstrual cycle. They typically clear up on their own however the problem comes when it can’t be released and causes pain for a woman. Ovarian cyst pelvic pain is not an easy thing to deal with. Once you’ve been diagnosed with a cyst you might assume that the only solution to overcome the pain is through medication. Yes, it offers you some relief but you have to take medications that can have disruptive side effects which some of you will not favor it. There are some natural ways to relieve the pain that are safe and effective. Let’s see some ways of ovarian cyst pain relief. Try using heat at home as a remedy to help with ovarian cyst pelvic pain. The heat can come from a hot water bottle or a heating pad. Some women find that a warm bath is effective and you can get the best results by direct the pain towards your back. Place a towel between your skin and the heat source so there’s no redness. Heating your medicinal treatment is also a nice practice. One more way for ovarian cyst pain relief is by practicing healthy meal. Certain foods can be useful in reducing pain. Find the ones that are considered natural diuretics such as lettuce, tomatoes, carrots, and cucumbers. You can also take herbal teas, chamomile, raspberry and mint teas. Try drinking herbal teas instead of coffee as caffeine may be a stimulant for the pain. Eliminate estrogen rich foods such as non-organic red meat and dairy products. You should avoid alcohol and iron supplement unless your doctor tells you to take it. Drinking water throughout the day can also help the ovarian cyst pain relief. If you feel boring of taking plain water add a bit of lemon or lime juice to it and a mint leaf. Empty your bladder more regularly when you’re drinking this much fluid where delaying your time to the toilet can actually cause more discomfort in your pelvis, and this is something that you want to avoid. Another tips is always wear loose clothes. I see most women nowadays wear tight and squeezing clothing and it can increase the pain causes by ovarian cyst. Wear looser shirts & pants and you will probably feel that your pain from ovarian cysts been relieved in certain level. Although the tips above seems to work, the best way is to seek fro doctor’s advice on the best way you can get rid of your ovarian cyst pain including go for operation or taking some medicine. But don’t forget every second is important and it’s worth to try the suggestions mentioned above. List of Panasonic washing machine repair service center and Toshiba refrigerator service repair Center click now.